There has never been a more “Red-Neck-Rock Band” than the chainsaw blazing band Jackyl. Over the past 25 years, Jesse James Dupree has guided his band through the triumphs of the platinum selling self-titled album Jackyl, to the grueling pace of setting two Guinness World Records for playing 100 concerts in 50 days and performing 21 concerts in a 24-hour period. Jesse James Dupree takes a brief moment out of his busy schedule to discuss Jackyl’s new release, writing pop-songs, and playing at the up-coming Harley Davison Rally in Milwaukee. MAXIMUM INK (MI): A brand-new single appears on your 25th anniversary release () called “Hot & Nasty”. It’s a remake of a Black Oak Arkansas song. They were a well-known Southern rock band back in the ‘70’s. Have you always drawn inspiration from the Southern Rock sound? Jesse James Dupree (JD): Ya, we are kinda a throwback to the 70’s type of band ourself. When we first came out, people compared us to bands like AC/DC and Black Oak Arkansas. We were familiar with AC/DC, but we had to do some homework on Black Oak [Arkansas], and we fell in love with “Hot & Nasty.” We actually cut that song 20 years ago, and we found it in the vault. (MI): After 25 years together, where do you get your inspiration from today? (JD): We get our inspiration from being out on the road and hear some of the great bands that open for us, and we support a lot of young bands too. My son is in a band called Wayland. It’s just a mentality of “keep caring that touch” kinda thing. (MI): Yet you also co-wrote a song with well-known song writer Desmond Child. It was a song you wrote in a Paris for a boy-band called O-Town, “Love Should Be A Crime.” You wanted to write something a little different. But Desmond wanted to write a ‘Jackyl’ type of song. Why did you decide to do something different? (JD): I certainly don’t go around and advertise that. 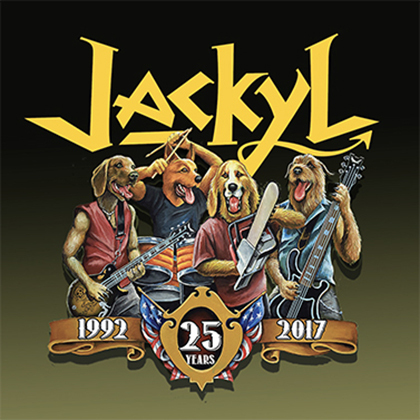 I write Jackyl stuff all the time and when I was over there [Paris], I wanted to do something different. We ended up writing a song that ended up on that boy-band record and it sold over 3 million records. You just grab it and go, you never know what you are going to come up with. (MI): Was it difficult to narrow down the 18 songs for this new release? (JD): We didn’t even debate it. We just picked some songs off each record which exemplifies the band, and put them in a collection. It’s not a ‘best-of’, it’s just a sample of 25 years, and what’s it taken to get where we are today. (MI): You guys are well known for your live shows, and even after 25 years, you still tour extensively. (JD): We play a lot different size venues. We play concert halls, arenas, NASCAR events, biker rallies. We are at Sturgis this week () at Full Throttle Saloon, it’s an amazing facility. There is not a better group of people than those that ride Harley Davidson motorcycles. They would give you their shirt off their back. (MI): When it comes to riding motorcycles, do you write songs when you are out riding? (JD): Ya, we ride a lot. Roman Glick (bass guitar) and I ride 15 thousand miles or more each year. We play a lot of charity motorcycle rallies, and it’s a good time to get inspiration for songs and writing lyrics. (MI): It’s not uncommon for you to debut new songs during a live show. When you guys play Milwaukee on September 2nd for the Harley Davidson Rally (), any chance we might hear something you are currently working on? (JD): Definitely. We are always working on new stuff. We are playing some new stuff off the Rowyco record, which is still new. It’s gunna be one hell of’a party. We are playing with Kenny Wayne Shepherd and it’s an amazing place, its incredible. (MI): During your live shows, you’ve been known to “play” the chainsaw when you cut up a bar stool on stage. Are you still doing that after 25 years? (MI): About how many bar stools have you cut up in 25 years of touring? (JD): Your guess is as good as mine, start doing the math. I figure a few hundred a year for 25 years.